The most powerful weightloss is now available without prescription. All natural Adipren 720. Reduction of 40-70% overall Fat under skin. Loss of 20-35% abdominal Fat. Up to 300% more Weight Loss while dieting. Boost your Confidence level and Self Esteem. Here’s a special warning — any product advertised via spam is a highly suspect one. No respectable, ethical company advertises in this manner. Not only is spam annoying, costing you and I real dollars and ruining our Internet experience, it is also illegal in many places in the world (including the U.S., which passed its own anti-spam legislation recently — the Can-Spam Act of 2003). Good luck getting a refund! OK, back to the Adipren product. If you click through any one of the numerous Web sites referenced in this spam, you’ll see a pile of unsubstantiated tripe — “voted #1 pill”, “doctor recommended” and so on. Of course, none of these statements are validated in any way at all. For instance, if Adipren is the #1 diet pill, who voted it to be so? And which doctor (or doctors) recommended this product? Surely if they were so impressed with the product they’d be willing to have their names associated with it publicly? 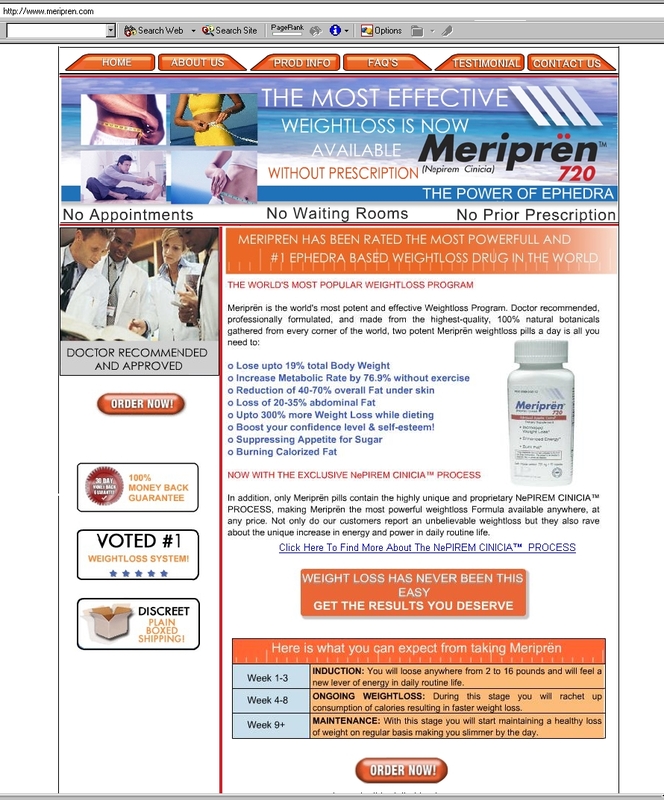 Interestingly, when I checked out the web sites selling Meripren I found that they were exactly the same, the claims were the same, and the clinical data presented was the same with one exception… these sites openly advertises Meripren as being an ephedra-based fat burner. 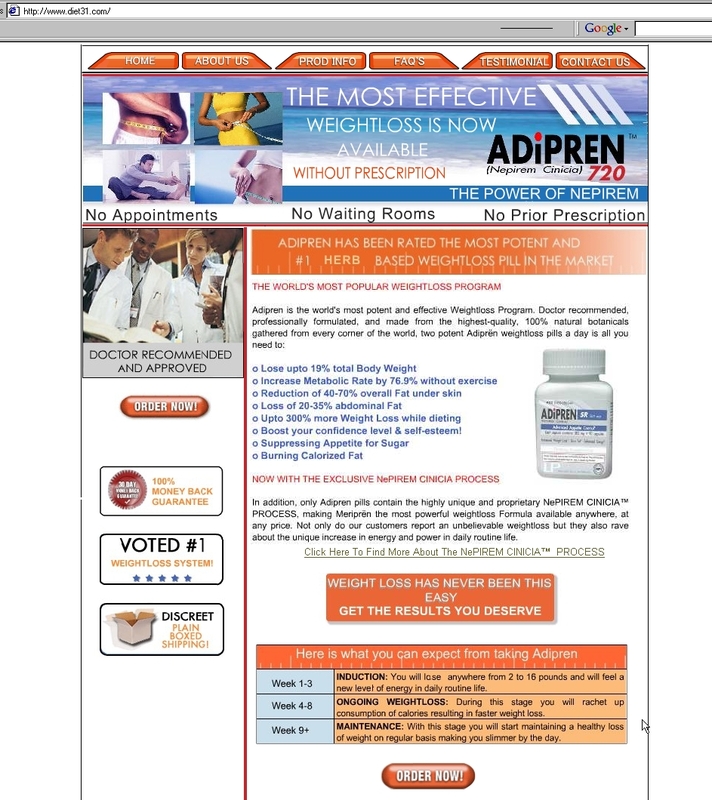 Click here to view the screenshot of the Adipren web site. Click here to view the screenshot of the Meripren web site. 1) Why not be up front about its ingredients? 2) Why cite clinical data from ephedra studies? Of course, should Adipren contain ephedra, the manufacturers can’t be too interested in making it public knowledge, as its use is now banned in many countries around the world. Order Adipren 720 from the US, Canada, the U.K. and many other countries, and you are purchasing an illegal product. Very likely it will be seized by customs and you’ll never even see it! To top off all this scummy behavior, the name of this product, Adipren, sounds an awful lot like Adipex — which is the prescription diet drug phentermine. Coincidence? I think not. While I’ve always been an fan of ephedra-based fat burners, that is not the issue here. For good or bad, ephedra use has now been banned in the US (Canadians can obtain products that contain no more than 8mg ephedra per serving), and this product is illegal. Additionally the company producing it has no ethics. As a consumer, you should always purchase from well-known brands with reputations to uphold. That’s your biggest protection.